23rd day of QQQ short term down-trend; GLD enters Stage 4 decline. Mainly on the sidelines, in cash. Meanwhile, commodities continue to weaken. 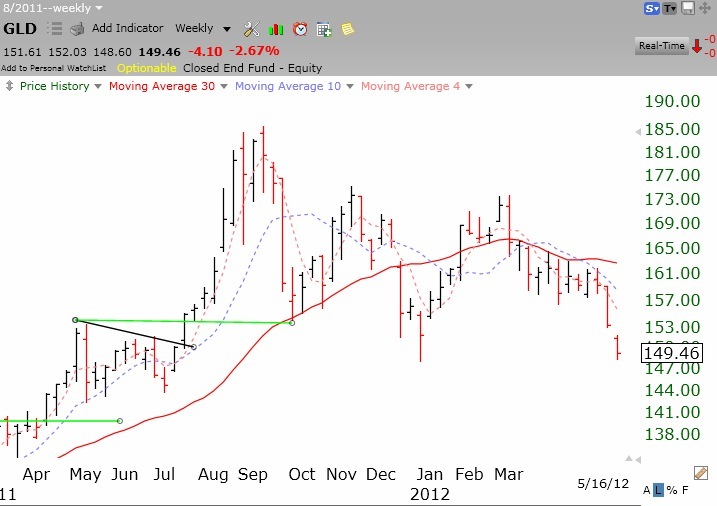 This weekly chart of the gold ETF, GLD, shows the deepening down-trend. Weinstein Stage 4 decline has begun. Click on chart to enlarge. I have read that 2x and 3x ETFs should only be used for day trading. It appears that as long as the market is trending then they are a good bet. What is your opinion on this? I agree 100%. Leveraged ETF’s are terrific in a sustained trend. The key is to have rules to enable one to get out quickly when the trend ends.